Eve and Evan are twins roped into yet another desperately dull Halloween by their parents. Managing to break free, they maraud, pumpkin-smash and toilet-paper, inadvertently crossing the thin line between worlds on this night of all nights. They enter a house and meet a demoness who has been lying in wait for just such a pair. A harrowing cat-and-mouse game ensues with the stakes being nothing less than their immortal souls. All Hallows Eve is a tale wrapped up in horror, comedy, and blood… and definitely not for young children. I had a revelation as a kid: Halloween… a day when I was actually encouraged to put on a mask and run around the neighborhood at night screaming like a little maniac. Then I was given candy. Really, what could be better?…way too much fun for one day of the year. My life’s path became expanding upon Halloween. I planned my costume months in advance. All Hallows Eve…no candy required. a ﻿link to the video instead. Whenever I am approaching a theatrical piece, the question that is foremost: How is this story best told? How is this character best portrayed? As an entrepreneur of puppetry, the answer shouldn’t always be: PUPPETS! Humans play humans really well…why would I go to all that trouble to re-create humanity? 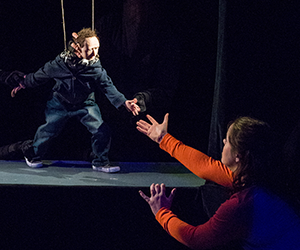 In this production, puppets play all the otherworldly characters best suited to them…and humans play humans. 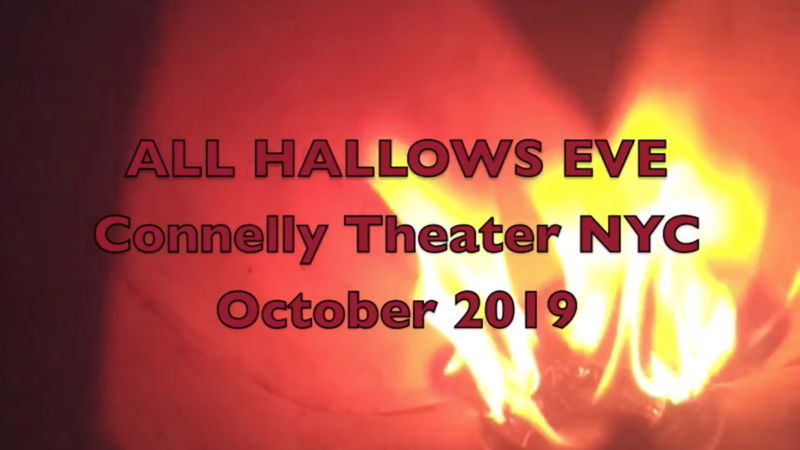 All Hallows Eve began as a twenty-minute Guest Artist Project for the 2013 National Puppetry Conference at the O’Neill Theater Center. 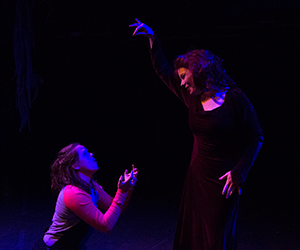 A lot of hard work later, the first version of the entire piece came together during a two-week residency, also at the O’Neill Theater Center, in February 2018 for three performances. This October production at the Connelly Theater will be its first presentation in New York City.